​Do you need a new eyelash curler to add to your makeup bag? Read this comprehensive guide to the best eyelash curler options available, how to use traditional and heated eyelash curlers, and how to maintain them. No makeup bag is complete without a great eyelash curler. After all, a high-quality eyelash curler adds the finishing touch to a perfect night out look. You do not need to be a makeup expert to know that eyes often play the more dramatic and striking role in a styled look. Mascara is useful for boosting volume and length but does not provide the dynamic shape and lift that a curler does. But for many, a lash curler can seem like a scary contraption that does not belong anywhere near your eye. You may even have some negative experiences that hold you back from using one. Pinched eyelids and yanked lashes are never any fun. It is the perfect tool for adding both volume and curl to your eyelashes with or without applying mascara. The eyelash curler usually plays a role just before putting on mascara. It provides a natural curl to the lashes that no curling mascara can achieve. Instead, mascara is great for adding definition and volume to already-curled lashes. That means that an eyelash curler is essential for those who wear makeup. It is also a good choice for those who prefer not to wear makeup. It can create the illusion that you are more awake and bright-eyed without a drop of cosmetics. Whether your makeup bag is fully stocked or not, an eyelash curler is a must-have accessory. It is essential to find the best eyelash curler, though. Cheaply made curlers of poor quality can actually cause damage to your eyelashes. A proper curler should not cause breakage, pinch your eyelids, yank your lashes out, or leave them bent in an unnatural angle. Instead, it should gently shape your eyelashes to brighten your eyes with a light lift without tugging. Every eyelash curler is different, so understanding your lashes and the best tools for them is essential. Short lashes have distinct needs from long lashes. You will also need to consider pressure and shape if you have particularly brittle eyelashes. There is a lot of debate about whether an eyelash curler should be used before or after applying mascara. The general rule of thumb is to use it before mascara to prevent damage, smearing, and uneven curl. Mascara adds a hard coat to your lashes, so using a curler afterward can cause your lashes to break. Be sure your eyelashes are clean and dry before curling. If you just showered or washed your face, wait a few minutes. Just like hair, wet lashes will not curl and can clump up unnaturally. Apply eyeshadow and eyeliner as needed. Be cautious if you are using false eyelashes in your makeup look. The pressure from an eyelash curler can tug lashes off if the glue has not dried. If you plan on wearing false eyelashes, use your curler before applying them to your lids or wait until the glue has thoroughly dried before curling. Position yourself in front of a well-lit mirror and open your eyes wide. Start with the curler angled to the inside corner of your eye. These lashes tend to be shorter, so you will get a more even curl if you target them separately from the longer outer lashes. Carefully put your eyelashes through the open curler as close to your lid as possible without pinching. Lightly compress the curler so you can see your lashes curling around the tool. Hold for around 10 seconds. Repeat on the outside corner of your eye until all your lashes are curled. Repeat as necessary until you reach your desired curl. Your inner lashes tend to be shorter than your outer lashes, so separately curling them provides the maximum boost. Do not grip too tightly when curling your lashes. A hard clamp can give your lashes that weird angled look that does not suit anyone’s style. Be gentle and hold it for longer, if needed. Once your lashes are curled to perfection, brush a coat or two of mascara over them, and you are ready to go. 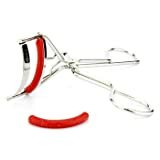 A traditional eyelash curler is often made of stainless steel and configured to clamp down on lashes to give them a gentle curl. These tools are a staple for both glam and natural looks. Here is a look at the best eyelash curler selections available. The Releveé Lash Curler is a lightweight addition to a makeup routine. Its design prevents both pinching and awkward angled lashes. It provides a long-lasting curl with maximum comfort. This curler includes a replacement pad. While additional pads are not available, users report that gums from other brands like Shiseido will work as well. A favorite of both celebrity makeup artists and makeup vloggers on Youtube, the Kevyn Aucoin Eyelash Curler is a cult classic. The tool was designed to curl each lash for full definition and maximum curl. The silicone pad was also made to accommodate lashes both before and after applying mascara to take your look to the next level. This simple eyelash curler has been recognized as the best tool for all eye shapes. It is flatter than many other curlers, which allows you to reach the base of your lashes easily without pinching skin. Overall, the quality of this curler makes it a top choice. Shiseido also sells replacement packs of lash pads to make curler maintenance as simple as possible. Perfect for short lashes, the S Curler is designed to curl any lashes regardless of length. It looks a bit different than other lash curlers, but with good reason. Without sidebars, this little tool is more versatile than its counterparts. It can comfortably accommodate rounder eyes and shorter lashes. The classic curler from Shu Uemura remains a solid choice by many. But, this new generation tool provides a solution for those who felt that the traditional curler did not fit their eye. The S Curler’s design provides full versatility and ergonomic support to suit virtually anyone. Made of high-quality stainless steel, the Japonesque Power Curl is true to its name. Its contoured design provides a comfortable fit for most people. It also comes with the perk of free lash pad replacements for the life of the curler, so keeping it maintained can ensure a long life. Japonesque’s travel curler is also an excellent choice for compact stowing. Many makeup artist bloggers have revered the SUQQU eyelash curler. Its unique design features an extended tip on the top that helps to push back hooded eyelids and reach the base of the lash line. It can take some time to get used to, but it is worth trying if you find other curlers ineffective. It comes with two replacement pads, which is a nice perk compared to many luxury brands that provide only one (or none at all). 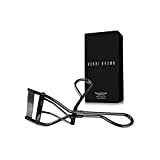 Known as an instant eye opener, the Bobbi Brown Gentle Curl eyelash curler is a classic choice from a trusted and renowned makeup brand. While it may not have the exclusive feel as some of the boutique brands, it is a comfortable and affordable choice from a reliable company. 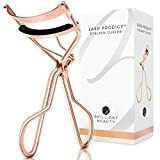 This eyelash curler is available in the makeup section of most department stores, including Macy's, Nordstrom, Neiman Marcus, and Bloomingdales. This tweezer-looking device is the ideal tool for those who have not had the best luck with traditional eyelash curlers. The minimalist design provides maximum control to reach even the shortest, straightest lashes. It does require a bit of extra work to curl all your lashes evenly, but it serves as a useful alternative to regular curlers. This cost-effective option is available at most stores and on Amazon, making it an easily accessible choice for beginners. You will not get the quality of the higher-end curlers, but it is an excellent tool if you are looking for a price tag below $10. It also comes with three replacement pads, which is more than most curlers. The added pads allow you to keep your curler fresh and clean for months. They also have an upgraded rose gold professional quality version for a bit more. Heated eyelash curlers take beauty to the next level by adding more defined curl as well as keeping them looking their best. The higher temperature locks the shape of the lashes in place, much like a regular curling iron. Heated curlers do not generally have a clamp like traditional options. Instead, they usually have a wand or a comb that heats up and curls your lashes as you gently brush them over. Heated curlers are perfect for those who are tired of pinched skin and unnatural crimping. Take a look at the top heated eyelash curlers on the market. The Panasonic EH2351AC is an excellent choice for a basic heated curler at an affordable price. The wand has dually heated pads for even heating and curling. It is ergonomically designed to be comfortable for both right- and left-handers. Batteries (AAA) are not included. The Heated Eyelash Curler with Comb Design Lash Curler uses warm air to curl lashes instead of a heated wand. This heated curler is unique because it has cool mode technology as well. 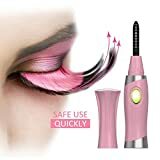 Cooling mode blows cold air that dries adhesives and mascara, so you actually can use this tool on false and mascaraed eyelashes. The cool air can also clean your lashes of dust and debris that can come with a makeup routine. Two antibacterial silicone brushes make this tool both easy to use and easy to maintain. One AAA battery is included. The Chella Heated Eyelash Curler is easy to use and supported by countless reviews and rankings online. The simple wand design is safe and effective for achieving a dramatic curl. The head is wider than most heated curlers, which speeds up the curling process. The resulting curl is gentle and natural so that it can be a part of your morning and evening routine. One AAA battery is included. The EYE Crie combines the function of a traditional eyelash curler and the technology of a heated one for a useful hybrid model. It only takes seconds for the lash pad to heat up. A simple press of a button clamps your lashes like a classic curler, and the added heat holds the curl for up to eight hours. It also lights up so it can be used in dark settings. Batteries (AAA) are not included. Curler maintenance is not just about ensuring your tool's longevity. It is also about preserving the integrity of your eyelashes. Eyelash curlers that are dirty or old are not only ineffective but can cause long-term damage to both your lashes and your eyes. Clean your curler every week with a cotton ball and rubbing alcohol. Wipe it down to clear off eyeshadow, skin cells, and other gunk that may accumulate on the pad. Every few months, go the extra distance and replace the curling pad itself. Most curlers come with replacements, but you can generally buy more from the seller. A new curling pad keeps your eyes clean, as well as providing a fresh curl for your lashes. Styling your eyes can be rewarding, but understand that your eyes are also an essential organ. Exposing yourself to an eyelash curler with bacteria and oil on it can have adverse effects that are beyond beauty. Consider your health and be sure to keep your eyelash curler in tip-top shape. After all, you should be replacing your makeup every three to six months. Include your curler in that schedule as well.